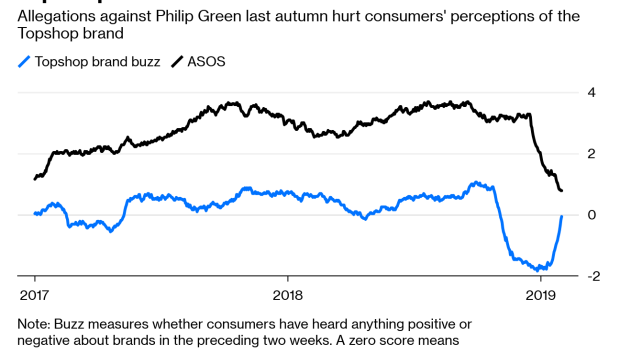 (Bloomberg Opinion) -- Just as shoppers are beginning to open their wallets once more, Philip Green’s Arcadia retail empire has been engulfed in another controversy. Over the weekend, the Telegraph newspaper published details of alleged harassment by the billionaire owner of the Topshop clothing chain. Green has categorically denied all the claims – but they come a delicate time for the retail industry, and for Green’s own business in particular. Back in October, the 66-year-old was identified in parliament as the British businessmen alleged to have used legal agreements and payments to hide accusations of sexual harassment, bullying and racist abuse. Those initial revelations dented customers’ perceptions of Topshop, still the jewel in Green’s retail conglomerate, even if it has lost its luster over the past few years. Customers’ purchases three months also fell. But both the buzz and revenue trends recovered, to some extent, in December and in the January sales. So if this pattern is anything to go by, the impact of the latest allegations should also be relatively brief. It may be that the decline at Topshop reflects broader conditions in the retail market. The last quarter of 2018 was unseasonably warm, while consumer confidence dipped as the prospects of Britain crashing out of the EU without a deal increased. Asos – an online rival in the young fashion market – also suffered a dip in buzz and sales a few weeks later. Green will certainly be hoping that any damage is short-lived. But the risk is the story continues to dominate the headlines, and that could take a toll on the retailer’s valuation if its owner ever decided to sell. The odds on Green seeking some kind of exit have got to have shortened given the events over the past six months. Topshop had an enterprise value of 2 billion pounds ($2.3 billion) in 2012, when Green sold a 25 percent stake in the chain to U.S. private equity group Leonard Green & Partners. The business is likely to be worth significantly less today, thanks to the rise of online rivals. The allegations about Green’s behavior will do nothing to enhance Topshop’s value in the longer term.